Throughout her career as a sculptor, Nora Naranjo Morse has confronted contradictions between what she knows as a Kha Pˈo (Santa Clara Pueblo) woman and what she observes in the world. As a young artists, she began to move away from working on traditional pottery when she understood how the art market commodified Pueblo culture. Naranjo Morse took up the role of cultural critic, addressing the impact of Westernization within her Tewa community. But more than just pointing to the struggles, Naranjo Morse directs us to values based in Indigenous knowledge. The sculpture in this exhibition represents the shifts in Naranjo Morse’s artwork over the past 15 years and includes artworks from distinct bodies of work. In that time, she has experimented with new media, found new inspiration, and expanded the scale of her works. She continues to build on her work with nan (natural Santa Clara clay) that she gathers from the clay pit that is near the Kha Pˈo Owinghe (Santa Clara Pureblo). Nan is always at the heart of her sculpture, even when working with metals and found materials. In her exploration of new sculptural techniques, Naranjo Morse’s artworks advance the trajectory of Indigenous artistic traditions. When shifting between materials from nan to metal and back to nan, she raises her own questions about cultural change. She challenges the expectations that Pueblo art must remain confined by a set of restrictions deemed traditional by an outside commercial force. Resisting the idea that cultural loss is probable or inevitable, Naranjo Morse offers an alternative: embrace traditional Indegenous knowledge as a solution to the urgent issues of our time. Throughout her career, Nora Naranjo Morse’s artworks have addressed the commodification of indigenous culture. In her new project, Remembering, she appropriates the billboards in the Southwest to disrupt commercial advertising. Her billboards promote the protection of the sacredness of life. 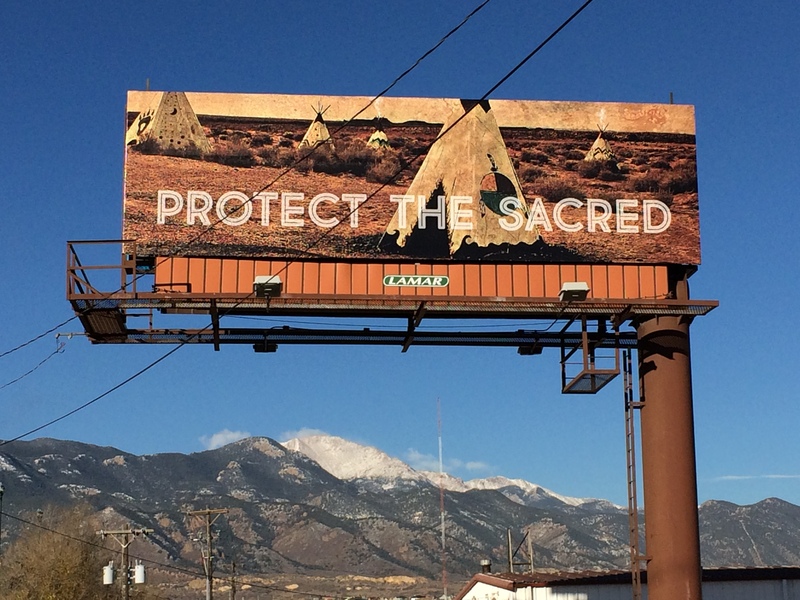 Nora Naranjo Morse selected this site to engage the public’s awareness of Tava mountain (aka Pikes Peak), a sacred space for the Ute people, and the industrialized space of the Martin Drake Power Station on I-25. The power station exists on traditional tribal lands of the Ute people — a fact so many travelers along I-25 are unaware of. The message of the billboard accompanied by an image Native people will recognize as cultural in nature. This message is for them as well. Remembering acknowledges and reaffirms the values crucial to our survival as indigenous people — Land. Culture. Community. Family Artists Statement: My project entitled, Remembering is inspired by the billboards I saw as a child growing up in the Southwest where billboards were a familiar site. The large advertisements were often strung together — sometimes only 20 feet apart — and were stretched along the interstate for miles. From a 10-cent cup of coffee to Handmade Indian crafts, the images and colorful lettering on the billboards were big and bright enough to see from a distance. The messaging of selling gas and coffee alongside culture both intrigued and confused me. I never understood what a 10 foot high, illustrated caricature of an Indian woman making pottery and, kinda resembling my Aunt Carma, had in common with the price of gas. I was unable to make sense of how someone, not from the same culture, saw and commodified the culture I was from. This conflicted with my true identity, an identity that came and still comes from my community, culture, and the land we walk. As an adult, I can clearly see the same kind of advertising on certain sections of I-40. These new billboards reminded of the insidious marginalization of culture that still comes from advertising — then and now. So, Remembering is a response to the billboards that cluttered my youth with confusion. Remembering is not advertising in the “normal” sense of the word. However, it is promoting a non-tangible concept. It’s the concept of protecting the sacred-ness of life no matter who we are, where we’re from or, where we’re going.